It’s been a few months now since the launch of TransferLab Data Scouting platform, so we thought we’d give you a quick tour of the platform to give you a better idea of what we’ve been developing for the past eighteen months. First off, it’s not all our own work. Analytics FC have partnered with Lane Clark and Peacock (LCP), a London based firm specialising in business analytics, to develop the online software platform. LCP are a £100 million turnover company with their own in-house team of data analysts and software engineers. We really fell on our feet with this partnership! So, without further ado, let’s take a look at what TransferLab can do. The framework for TransferLab is built on a complex Markov Chain algorithm which rewards or penalises every action on a football pitch based on its effect on a team’s likelihood of scoring or conceding. A value is then applied to every player-level metric showing their contribution toward the team’s Expected Goals for and against. It has a high level of predictive power at both the team and player level. All player-level metrics are then adjusted using our league to league “exchange rates”, which translates every output based on team and league strength, as well as the historical conversion rate of player performance when transferring across leagues. Upon signing into the TransferLab platform, you have the ability to define fully bespoke positional profiles that allow you to tailor your searches with over 50 metrics to choose from. You may be looking for a central midfielder who is extremely defensive, but not care if his offensive numbers are low; alternatively, you may be looking for a striker to complement your creative midfielders, so you want to prioritise his goal-scoring over his passing ability. Each metric can be weighted according to how important you want it to be. All these bespoke elements feed into the “Quality” score, which is how the search tool generates a short-list for you: depending on what metrics you have chosen, how much you value them, and any other search parameters, TransferLab will give players a score out of 100 for how suitable they are. 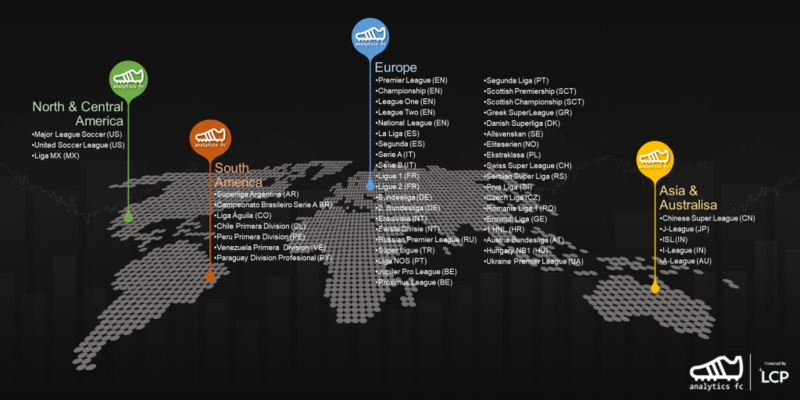 TransferLab offers you unrivalled breadth of data coverage, featuring players from over fifty domestic league from around the world, with more leagues being added all the time! If there are certain clubs that you prefer to scout from within a competition, or certain leagues, you can use the “My Market” feature to create your own customised search coverage. Due to our staff’s experience within the football industry and an extensive consulting period with clubs, big and small, we know what filters you need to find the players you want. Position, league, preferred foot, age, contract expiry, height, estimated value, and minutes played are just some of the options available to help filter your search..
You can even export the data if you have preferred visualisations that you would like to generate through external programs such as Tableau, R, or Python. Sometimes you may simply want a “like for like” replacement, or otherwise be interested in seeing who profiles similarly to a player that you have your eye on. With TransferLab, a player’s most similar players are just a click away, and the search has all the same filters and functionality as the normal search. If there are certain aspects of the player that you want to replace that you don’t value, you can reduce their importance here just as in the main search. So, if you want a similar player to Cesc Fabregas with his creative output, but you want a player with a bit more defensive contribution, go ahead and adjust the importance of those metrics, see what you find! The positional profiles that you define become the basis of player profiles, which you can view by clicking on any player in the search view. In addition to adjusted advanced metrics, you can view a player’s career history, biographical information, and create heat maps of their events on the pitch. We know that metric values themselves can be useless, so each metric has a percentile next to it, which by default shows how a player ranks relative to all players within that position. Cristiano Ronaldo, for example, is in the 100th percentile of attackers for the expected goals from his shooting chances. Can’t decide between two players? Or want to compare what you have to what you want? In TransferLab, comparing two or more players is as simple as the click of a button. Radar charts allow you to compare outputs overall, while density plots allow you to hone in on how these players are performing compared to the rest of the population. On top of these features, you can view a player’s projected career through the “Age Curves” visualisation option. We use a position-specific method to estimate a player’s future output based on their age and performance level, allowing you to assess the potential of a bright prospect or avoid signing a high performer who might be expected to have an impending drop-off in quality. This is still all based on the selection of metrics that you choose for your positional profiles! The Shadow Squads page allows you to keep an eye on your squad management and potential targets, saving shortlists for you to easily view again and keep track of in one, easy to use interface. 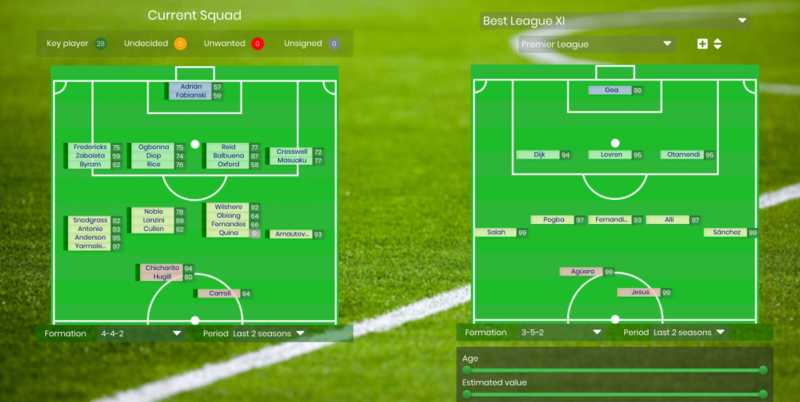 Our Best XI engine allows you to quickly see the best players (relative to the positional profiles you choose) in any league within TransferLab according to our unique player performance model, while you also have instant access to the depth charts of any club in your subscription package. Analytics is often pitted against traditional scouting, but we could not disagree more with this. The best recruitment departments will see the two as complementary, using traditional scouting to look into the blind spots that can arise from stats-based scouting and vice versa. TransferLab is built with this vision in mind, allowing you to generate shortlists and manage your scouts within the same tool. Scouting department calendars, activity logs and activity feeds allow you to quickly get a view of what your scouts are up to on day-to-day basis. 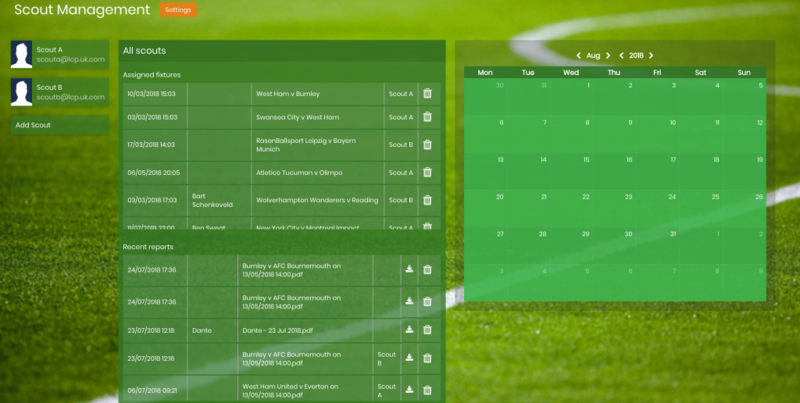 You can assign fixtures to scouts and communicate with other clubs to arrange tickets easily with our built in e-mailing system. Our reporting templates for team and player scout reports were designed in collaboration with some of the biggest clubs in the world, but of course, as with most of the TransferLab platform these can be tailored to your needs. All reports are safely logged and housed within the system for easy access or download. We’ve spent a lot of time designing TransferLab to significantly improve the recruitment operations of professional football clubs. We’ve been careful to ensure that it is flexible and can be adjusted and made bespoke to the way any Club wants to work. We wholeheartedly believe it is currently unrivalled and can provide the competitive edge which clubs are looking for. 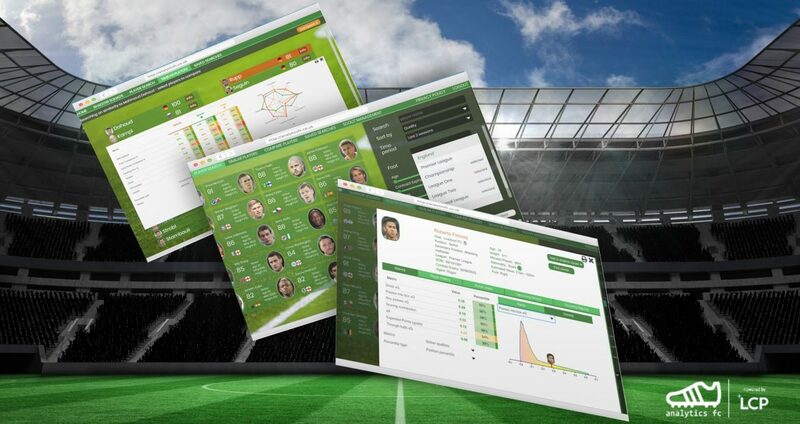 The combination of league breadth, an unrivalled advanced stats model, and scout management within one suite of tools makes it an extremely appealing offering to anyone looking to combine data analytics and traditional scouting methods to improve their recruitment decisions. Right now, if you want to generate the level of insight available from a tool like TransferLab, you would have to pay expensive data costs, hire a team of data scientists, and maintain infrastructure costs. TransferLab offers the whole package – you can sign up without any current data subscription – and our top level offering costs the same per year as an intern. Don’t believe us? Try it yourself: sign up for your free trial here.